Join forces with family, friends and neighbors for the 33rd annual Citywide Spring Cleanup! Why: Each year, hundreds of volunteers gather across Saint Paul for the Citywide Spring Cleanup to pick up garbage/litter/trash that has recently become exposed due to the melting snow. Who: Individuals and groups of all ages come together to help beautify the city of Saint Paul. Where and How: Participating is easy! Register below, and then drop by your selected CLEANUP SITE any time between 9 and 11:30 am, to pick up bags, gloves, snacks and meet your neighbors and community members. Then, head out and clean up your park or neighborhood of choice. New: Our Interactive Map! This map shows where our kickoff sites are, locations to cleanup along our strees, and places to leave your bags for pickup (not in parks). If cleaning up in our parks please leave your bags by a garbage can. PLEASE NOTE: This event does not collect household items. For more information on where and when to drop off household items please refer to Public Works page by clicking here. Join in on the #trashtagSTP challenge! The #trashtag challenge is a new viral trend that challenges folks to take a before and after photo of an area they cleaned up and post it to social media using #trashtag. 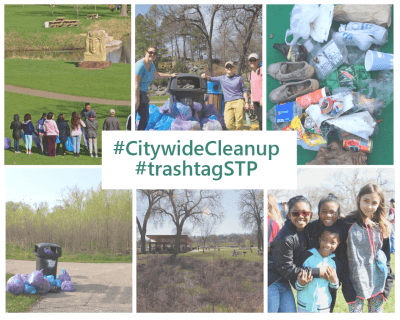 Let's get #trashtagSTP trending and show the world how much Saint Paul cares about our parks and neighborhoods! Register for the Citywide Spring Cleanup, then share your before and after photos using #trashtagSTP. Thank you to all of our site hosts and sponsors!